NEW! Samsung Flat-panel TVs with 30 channels of HD programming. Easy-access Plug-and-Play feature makes it simple to connect electronics. The La Quinta Inn San Antonio Vance Jackson is just north of downtown San Antonio, southwest of the airport. We are the perfect destination for visitors to San Antonio Medical Center, Texas Heart Hospital, and South Texas Blood & Tissue. It's an easy drive to SeaWorld San Antonio, River Walk, and Six Flags Fiesta Texas. The sprawling Crossroads Mall is nearby and a variety of restaurants within walking distance, including La Fogata. The spacious rooms at the La Quinta Inn San Antonio Vance Jackson surround a lushly landscaped courtyard with a Picnic Gazebo. Guests can relax on the sundeck by the sparkling outdoor swimming pool. You will find many useful amenities in all rooms such as free high-speed Internet access, a hair dryer, and coffee maker. We have 600 square feet of meeting space available. Our friendly staff serves a fantastic Free Bright Side Breakfast every morning so you can start the day right. 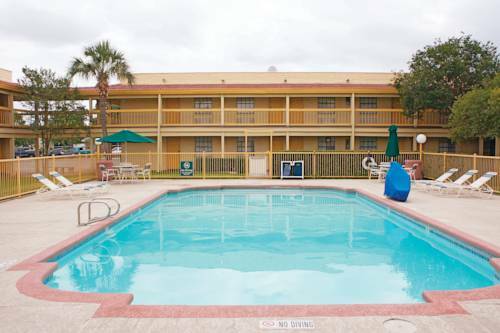 Easy access from I-10 (exit 565C). Take a 45 minute stroll through the underworld of Texas. Tour starts just past the dinosaur. ~56 miles from San Antonio.